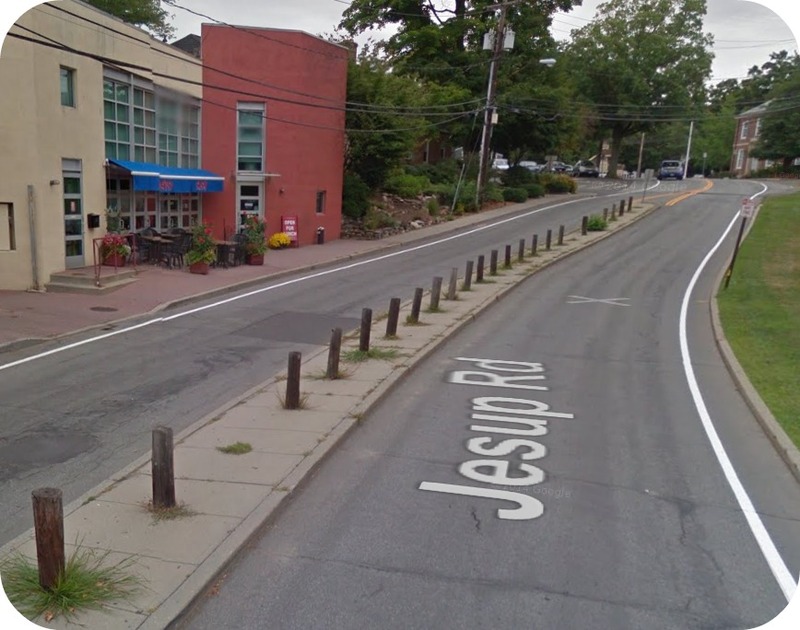 Turns out, about 30 years ago a public works director got angry about garbage trucks backing over the median strip to get to the restaurant and business dumpsters. He planted poles. We’ve been stuck with the eyesore ever since. Our long Jesup Road nightmare is over. 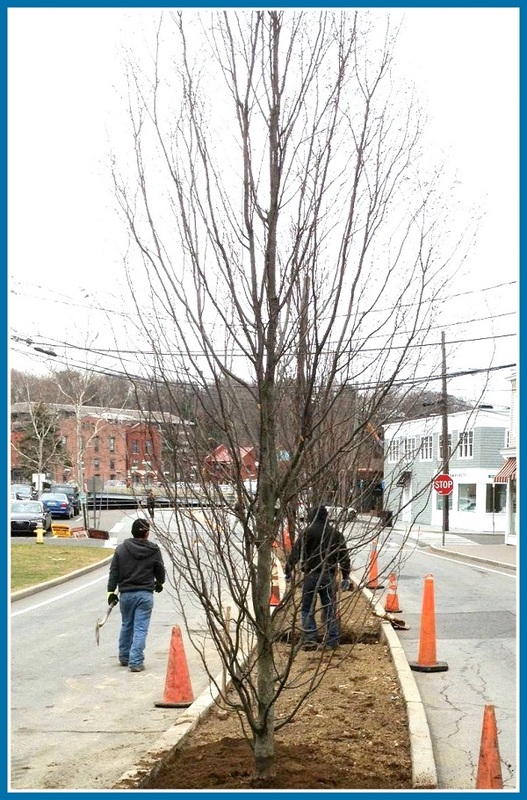 As part of Westport’s beautification process, Public Works is sprucing up the median. They’re adding soil, and planting trees. Tree warden Bruce Lindsay is supervising the tree work. Sure, there are lots of plans for re-imagining Jesup Green. But change comes slowly to Westport. By the time we’re ready to reconfigure the area, there may be an outcry to save the median trees. Because, of course, they’ll have “always” been there. This entry was posted in Downtown, Environment, Restaurants and tagged Jesup Green, Matsu Sushi, Westport Public Works Department. Bookmark the permalink. I just saw the completed project – what a positive difference this has made to the streetscape. It just goes to show your that, as with the relocated Kemper-Gunn house, small things add up to a big thing. Dan, Who was Jesup, and how did his name come to be attached to this public space? — Scott. The Jessups were prominent merchant traders. The family’s docks, etc were originally located in the area at issue. The Jessup mansion, though treated with something less than reverence by the current owners, is an architecturally significant structure. Located at, I think, 245 Post Road East, it is now the parsonage for the Saugatuck Congregational Church. Are they dogwoods? Hope there’s enough earth/water there for their roots. As far as noting notable trees, why not have them marked discreetly, as old growth trees in some municipalities are marked/protected. That will look soooo much better when these babies come alive in the spring. The Jesup Green appeal was always just sort of so so, for as many years as I can remember, landscape wise. Lilac trees might have worked nicely here, because when properly pruned, they can grow tall, but not too wide for the close proximity of the road. And the smell in the spring? Would be fab! Nancy has a good point about enough room for root structure and water retention and/or drainage. Meanwhile, at the northeast corner of Jesup Green, six parking spaces in the row facing the green have been taken over by construction equipment, in the middle of a busy and abbreviated holiday shopping season. Is this related to the tree-planting project?